This was the very first visit for Heath Farm staff and students, the benefits of which are immeasurable. The benefits for students and staff alike in respect of an even stronger bonding and also a better understanding of each other’s needs. The most important factor of all though is having FUN! 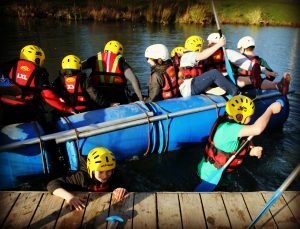 Our students were outstanding both in their behaviour, aptitude but predominantly in their courage especially for some who came well and truly out of their comfort zone in some of the activities. From the giant swing that pulled you [ in pairs] high up above the ground, with one of the pair having to pull the string that catapulted you forward into the air to tunnelling underground on your belly in mud whilst shouting and supporting your team throughout. 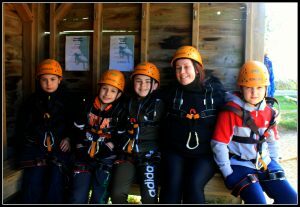 The zip wiring was a tough call for those fearing heights , one memory I will personally cherish is witnessing one of our boy’s shaking with fear and crying he could not do it. A member of staff who is terrified of heights went before him crying as she did so to prove she did it despite her being petrified of heights. This spurred this boy on and the elation and accomplishment etched on this boy’s face when he reached the other end was priceless! He not only went again but launched himself from the other end of the platform so he could go even faster along the wire whilst shrieking with joy. For some students it was as simple as the first time they had ever been away from home , once some worked through their anxiety with the support of staff in their first night again their smiles were indicative of new found independence and confidence. 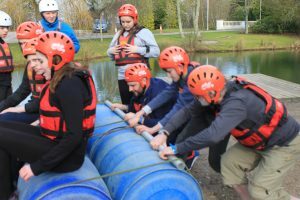 The raft building was hilarious with all kind of antics at play with staff and students alike, from playful rocking of the raft to a few purposeful pushes into the water! Archery was great fun and the PGL staff were very accommodating and understanding of our students’ in fact I would say in some instances it was clear the staff loved our students enthusiasm in each task. 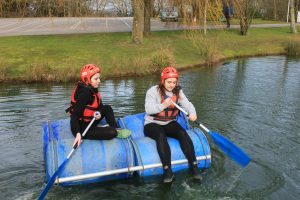 Much banter and singing songs between each activity which kept weary spirits high . The climbing and abseiling was daunting for most, the encouragement and support kept us all going with some amazing results! Then there was the evening treat around the fire with toasted marshmallows with singing and storytelling. 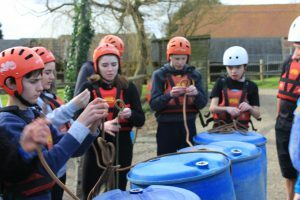 All these things and more contribute to a great time had by all, indicative when students’ continually ask staff when we are going to PGL again. This event only heightens the cohesiveness and bond of what is Heath Farm. To summarise it was exhausting, exhilarating, great fun and memories were made that were and are clearly cherished by all.